If the following blog interests you, it's probably because you're using Entity Framework with a Code-First approach and whatever it is you are trying to do *must* use an ObjectContext instead of the standard DbContext. I'm sure, like me, you thought this shouldn't be too hard. Then you started hitting roadblocks like, Metadata is required in your connection string. What's metadata? This is only needed in Database-First so you can tell the framework where your edmx and other definition files are, so why do I need this with Code-First, I don't have these files? To understand how the solution came about, it's important to understand one of the key differences between ObjectContext and DbContext. In the scenario above, it's to do with the metadata. A DbContext is an extension of ObjectContext and is intelligent enough to build its own metadata from either the code or the database. However, ObjectContext is not that smart, it must be strictly supplied the metadata. With Database-First this is easy because the edmx file does this for us. However, with Code-First, it's not. At first glance this doesn't make sense either, aren't my Code-First models definitions enough? Yes and no. Yes, they are, but not without a few extra lines of code first! Enough chit-chat, let's get down to the solution. For this example, I have created a new MVC application and added the Entity Framework via the NuGet package manager. Next, for cleanliness only, I created a new Domain class library that will house my models and context files. Next, I created three different models that create a many-to-many relationship, Country, Language, and CountryLanguages. A new DbModelBuilder must be created that creates the metadata for the ObjectContext to understand how the data is defined. As you can see, I have one builder.Entity<> per model. Create a new connection to a local Sql Express database. Create a new DbModelBuilder that contains the metadata definition of the database. Create a new SqlConnection with the connection string. Create a new DbCompiledModel with the compiled metadata from the builder. 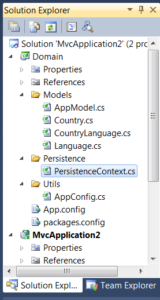 Create a new PersistenceContext by calling the CreateObjectContext from the compiled metadata and connection. That's it, Code-First using an ObjectContext! The missing LINQ, I mean link, has been found to use ObjectContext and Entity Framework's Code-First approach. The key ingredient is a DbModelBuilder with one Entity<> per model in your application defined. Stay tuned for more Entity Framework fun!